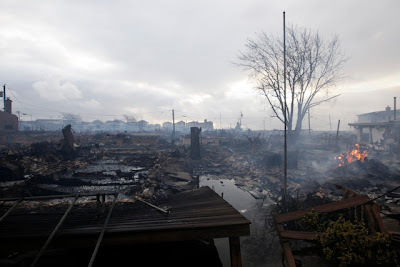 Yet Another Faked Homocon "Hate Crime"
Last night at least 80 homes in the Queens neighborhood of Breezy Point were destroyed in a six-alarm blaze. Firefighters faced chest-deep flood waters and rescued dozens of residents by boat. Breezy Point and all of the Rockaways are in Zone A and those rescued had defied the mandatory evacuation order. Over 200 firefighters responded and there were no fatalities.